Watermelons are very low in calories (just 30 calories per 100 g) and fats yet very rich source of numerous health promoting phyto-nutrients and anti-oxidants that are essential for optimum health. It is also rich in anti-oxidant flavonoids like lycopene, beta-carotene, lutein, zeaxanthin and cryptoxanthin. These antioxidants are found to offer protection against colon, prostate, breast, endometrial, lung, and pancreatic cancers. Phyto-chemicals present in watermelon like lycopene and carotenoids have the ability to help protect cells and other structures in the body from oxygen-free radicals. Watermelon is an excellent source of carotenoid pigment, lycopene and indeed, superior to raw red tomato. 100 g of fresh melon provides 4532 µg lycopene, whereas only 2573 µg in tomatoes. Studies suggest that lycopene offer certain protection to skin from harmful UV rays. 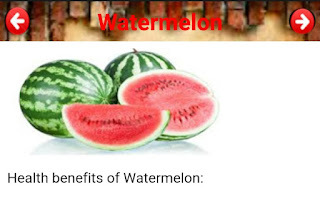 Watermelon fruit is a good source of potassium; Potassium is an important component of cell and body fluids that helps controlling heart rate and blood pressure; It thus offers protection against stroke and coronary heart diseases. Furthermore, it contains a good amount of vitamin-B6 (pyridoxine), thiamin (vitamin B-1), vitamin-C, and manganese. Consumption of foods rich in vitamin-C helps the body develop resistance against infectious agents and scavenge harmful oxygen-free radicals. Manganese is used by the body as a co-factor for the antioxidant enzyme, superoxide dismutase. Total measured antioxidant strength (ORAC value) of watermelon is 142 µmol TE/100 g.